From left - Mary Smith (me) - Linda Wilcox and Mary Styne. Mary Katherine Kusner from Iowa City was ordained a deacon. Mary Frances Smith, Mary Suzanne Styne and Linda Ann Wilcox were ordained to the priesthood. 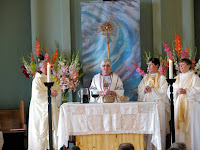 The ordination took place on Sunday, Aug. 16th. at 3:00 PM at First Universalist Church in Minneapolis, MN. Approximately 500 people attended. Several church reform groups, including Dignity ,MN - CTA, MN and the St. Joan's society and friends and family of the ordained helped with publicity and the reception. "The Leadership Conference of Women Religious has asked the Vatican to disclose why it is being investigated and who is funding the probe, and questioned why the sisters will not be allowed to see the final investigative report submitted to church leaders." On Sat. Aug. 15th, Mary Mother of Jesus Catholic Community celebrated an inclusive, joyful liturgy in honor of the the Blessed Mother on the feast of the Assumption in Falls Church, VA. Peg Bowen, assisted by her husband Bob and friend Donna Mogan designed the environment with beautiful plants, table cloths from her wedding day reception, "a holy water well", the placement of the pastoral staff within the community setting to symbolize the shared pastoral responsibility for fostering community and caring for one another. Peg and Donna presented the gifts. recited the offertory prayers. Andrea Johnson, bishop of the Eastern Region of RCWP and I (Bridget Mary Meehan), bishop of the Southern Region of RCWP co-presided. The community shared insights and stories about Mary's role in their spiritual journey in a dialogue homily. Several people said that they think RCWP is a prophetic movement in the Roman Catholic Church for which they are deeply grateful . After communion, each person took a small bottle of holy water that came from our "holy well" that I brought back from a holy well in Ireland. On Aug. 15th, in Ireland thousands of people visit holy wells and fill containers with water for use during the year. In County Laois, where I was born, a large crowd gathers at Lady Well at Ballinkill for a festive celebration. The Ballyroan band plays the music. My Dad who was a member of this band, played the Lourdes hymn, Amazing Grace, When the saints go marching in on the trumpet for our celebration in Falls Church. The community continued the festivities until after dark.